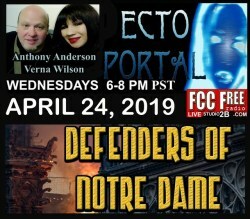 ANTHONY ANDERSON and VERNA WILSON will reveal the true meaning of the GARGOYLES that rest atop the NOTRE DAME CATHEDRAL in Paris France. Are they placed there for a reason or decoration? With the recent fire, were the DEFENDERS OF NOTRE DAME in place? Tune in and find out! 6-8pm PST Wednesdays Live in Studio 2B. #NSFWradio hosts J. Austin Graham and Tyler Owen Morris present unbelievable stories from reputable people: Navy Seal Jordan Heatherton. Topics: Navy Seals, the people not the movie, but Pill Paxton was in the movie so it might come up. Featuring music you need to hear from Estradasphere, Lords of Acid, and King Missile. Welcome to HAPPY HOUR WITH DJ LOOT!!! Join everyone’s favorite music-producer, DJ Loot, live from the World-Famous STUDIO 2B, as he plays lots of INDEPENDENT MUSIC spanning MULTIPLE GENRES, and more, from 4-6PM (PST)…….Special-guests J. Kent & AJ Wesley, Money Gang, and Z. Vuitton will be in-studio to talk about their music, and other fun topics! Be sure to visit www.djloot.biz, and to add DJ LOOT on all social-media platforms, @djloot916…….CHEERS!